What really lurks under your bed? 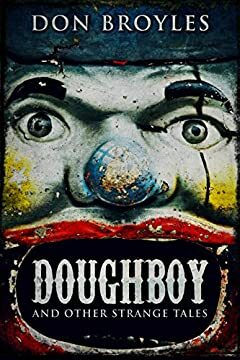 Would you like to know about the madness of clowns - or the helpless cries of the Doughboy as heâ€™s stuffed into the oven? Perhaps you fear being trapped in an elevatorâ€¦for a rather long period of time. Or going on vacation... to a land where screams are eternal, and the tears are rivers of red. But be careful when crossing the Cith Bridge, for the creatures there feast on things that are not quiteâ€¦ wholesome. If this sounds like your kind of journey, let Don Broyles be your guide in Doughboy And Other Strange Tales.